"Treasury yields are on the upswing. Here's how to adjust your portfolio." "The Billion Prices Project thinks inflation may have turned a sharp corner." "American consumers are facing the strongest inflation pressures in a year and a half, a sign of economic vitality likely to be welcomed by the Federal Reserve." "Inflation is back around the globe. A major factor in higher global prices so far has been oil. In developed markets . . . the impact of tightening labor markets will step in to pick up where oil has left off." The preceding headlines and ledes from The Wall Street Journal seem right out of current editions. In fact, they were published in the first quarter of each of the past four years. Going back even further, for the last fifteen years, 12-month inflation statistics such as the Personal Consumption Expenditures Price Index and the Consumer Price Index have exhibited a pattern of unusually high figures in January and February of each year, followed by lower statistics for the balance of the year, even after seasonal adjustment by the U.S. government statistical agencies. The seasonal patterns are most evident in the core inflation figures that exclude food and energy prices, as commodity-oriented prices do not exhibit such seasonal tendencies. 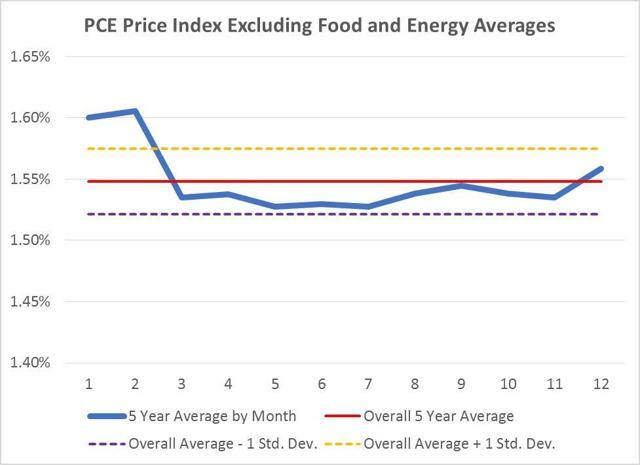 Chart 1 illustrates how average inflation over a year ago for January and February exceed averages for the remaining months by significantly more than normal statistical fluctuations, measured by standard deviation. Chart 1 - Monthly inflation statistics measured against year-ago months are unusually high for January and February. In the past 15 years, inflation in the years' first two months has exceeded that for remaining months two-thirds of the time, as illustrated in Table 1. 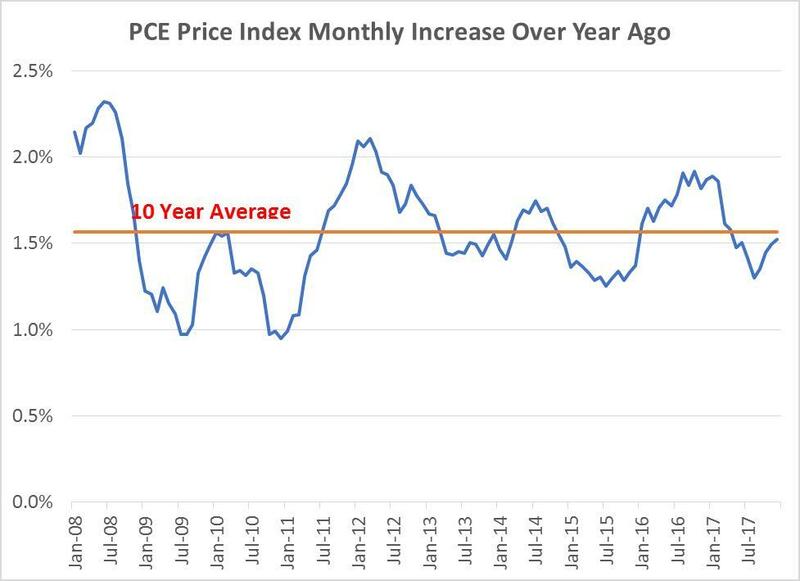 The same pattern prevails for the CPI - January and February are significantly higher than other months measured against a year ago, and the data is most evident for core prices. 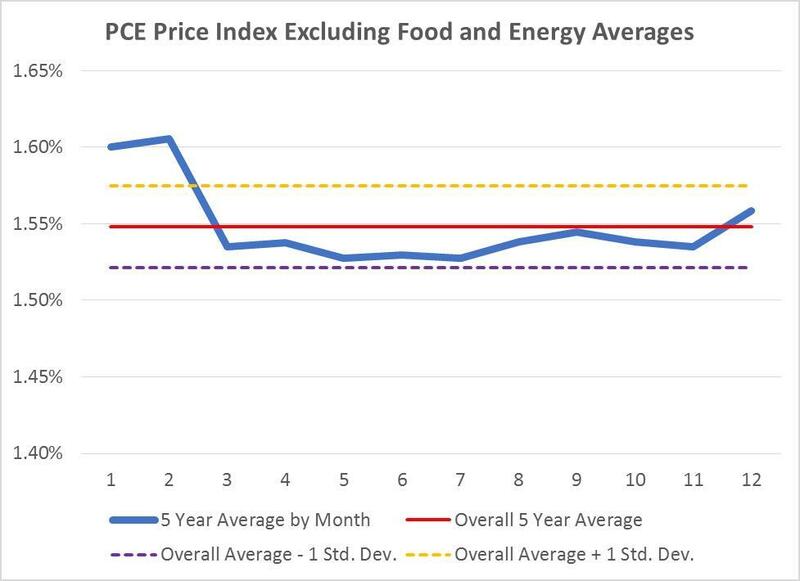 The CPI, excluding food, shelter, and energy, exhibits the strongest such effect, as the shelter component, reflecting housing asset prices, also lacks extra seasonality. The seasonal inflation fluctuations have not gone unnoticed in the financial markets. 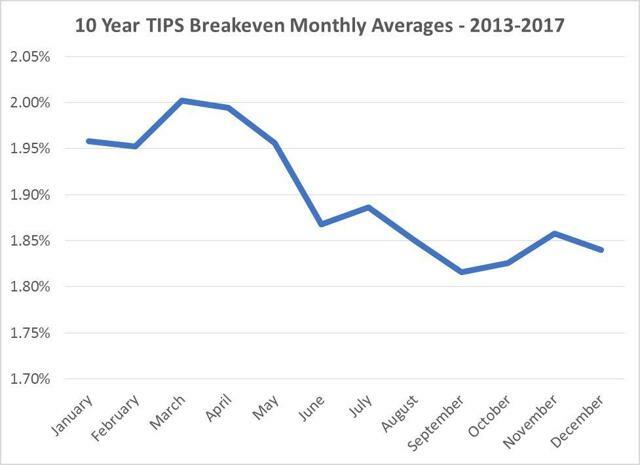 The breakeven rate, a measure of CPI inflation expected by the financial markets, is obtained from the difference between Treasury Inflation Protected Securities (TIPS) and regular US treasuries. Chart 2 shows a distinct seasonal pattern for TIPS breakevens over the last five years, reflecting the seasonality of inflation measures. So, how to account for the apparent seasonality of inflation data that already has been seasonally adjusted? Economists within the Federal Reserve System have examined the question of "residual seasonality" in GDP data and arrived at mixed conclusions. The San Francisco Fed has pointed out the consequences for PCE price data of residual seasonality in GDP data, where an understatement of GDP would be reflected in an overstatement of PCE inflation and vice versa. For all the analysis, the answers aren't clear, and the government agencies are continuing to improve their seasonal adjustments. One thing that is known is the past performance of inflation. 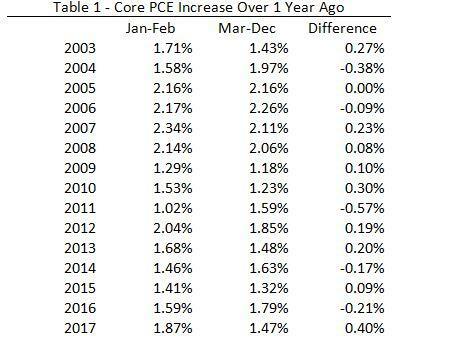 As shown in Chart 3, for the ten years since the Financial Crisis, inflation data, measured by the Fed's most reliable indicator, core PCE prices, has shown no overall trend, and has varied little from its average of 1.6%. Chart 3 - Inflation, measured by the Fed's preferred indicator, core PCE, has shown no long-term trend and has varied little from its 10-year average of 1.6%. Very large, sudden moves in core inflation figures are highly unusual. For the next few months, policymakers and investors will be well-advised to take forthcoming inflation data with more than a few grains of salt.